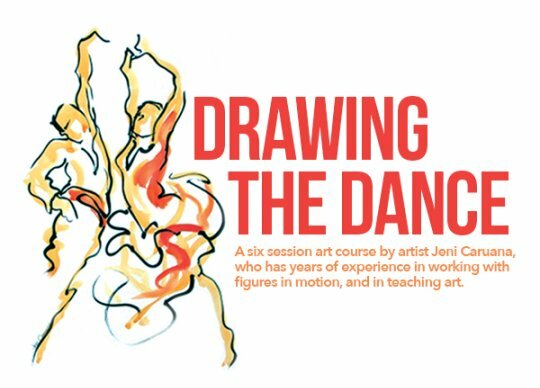 A six session art course by artist Jeni Caruana, who has years of experience in working with figures in motion, and in teaching art. This intensive course will take teenagers aged 14 to 16 from learning how to draw models to working with live dancers. You will learn the skills of measuring, gridding, gesture drawing and building spatial awareness. You will also explore different media in the form of paint, pastels and charcoal. Classes will take place at the Teatru Salesjan Studio, Triq Ġużè Howard, Tas-Sliema, on Thursday evenings from 6 – 8 pm, beginning on Ocober 23rd. The final session will be held on Friday 28th, during a dress rehearsal for a Flamenco performance at the Theatre. A selection of the works produced will be exhibited in the Theatre foyer during the dance performances on 29th and 30th October. The course will be taught in English. An apron or old clothes are recommended. The whole course will cost 80 euro, including all materials. No previous experience of figure drawing is necessary. For more information or to apply for this journey email us on info@teatrusalesjan.com.